The obituary of Henry Rountree. Wilson Daily Times, 14 September 1940. Is this the same Henry Rountree who spoke of Christmas-time serenades in an 1936 interview by a Federal Writers Project employee? Though it would seem so, the life details of the two Henrys do not seem to match. His parents are listed as Spencer and Julia Rountree, not Shark and Adell, as in the F.W.P. interview. The obituary reports his owners as the Tomlin family, but the narrative names Dock Rountree. The obituary centers around Henry Rountree’s work during the Civil War, which the narrative does not mention at all. 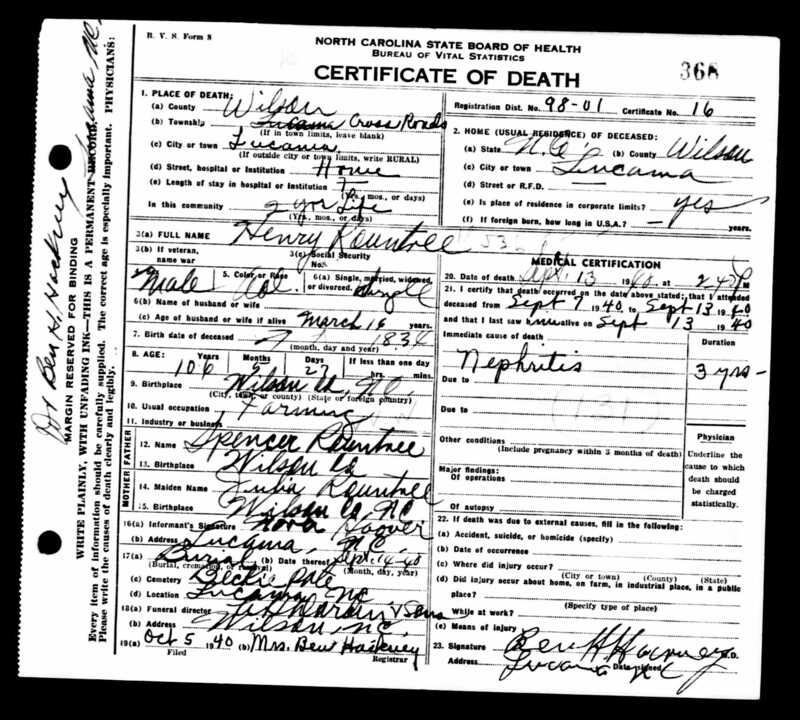 In the 1920 census of Cross Roads township, Wilson County: Simon Ricks, 34; wife Lula B., 29; children Mary E., 12, Alexander, 9, Etta, 6, Gertie, 4, and Roland, 2; mother-in-law Fannie Rountree, 58, widow; and uncle Henry Rountree, 74, widower. In the 1930 census of Cross Roads township, Wilson County: renting for $2/month, widowed farm laborer Nora Dew, 42; her children Lester, 15, and Etta, 11; uncle Henry Rountree, 85, farm laborer; and boarders Edna, 17, and Ella Lane, 14, and Elijah Terrell, 22. This is my family; a lot of oral history has been passed down even to my generation.. jane is my 3x grandma and Henry is my 4x grandpa and he is the same Henry Roundtree he was borne on Doc Rountree plantation. His parents were called Shark and Adell/ aida . this were part of our oral history.Nora Hoover recorded on the death Spencer bc that was his real name she were told.He was the surrogate father of Jane Mobley who was raised by the moses Rountree family and her birth was recorded in 1854. Their is a rich interesting story abt her and the Rountree family.Jane declared on her death bed that she was an African queen and came here at the tender age of 7.